Funk fusion rock Latin progressive improvisational composed. 1. Did You Make Any Money With That? 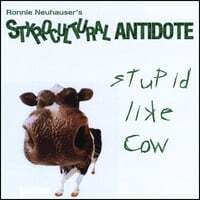 Ronnie Neuhauser\'s Styrocultural Antidote, Stupid Like Cow (No Cheez Records). For a 58-minute-long instrumental prog/jazz/avant-rock album, this is commendably approachable. The heads on these 10 songs are bright and tuneful, even when rhythmically slippery and tonally jagged, and the soloing is almost always melodic. There is deep structure at work in these pieces, which draws the listener in and keeps the ear occupied, and the vast majority of its passages fly by until suddenly the band is at an abstracted place far from the head, shot right off into space. Wherever it ventures, the trio always comes back home in what sounds like a natural manner. Neuhauser\'s scorched-earth guitar solos have great motion and Mike Perez\'s bass lines are full of caffeinated counterpoint; the band sounds like something larger than a trio. Some bits are more interesting in concept than in form (\"Schizo Goes the Weasel\" is probably best suited for musos, and the sonic splatter-painting \"Spacial Utterances\" exists best as a prop for the Noam Chomsky speech of which excerpts are included here), but the bulk of the album is as fun to listen to as it is to count to.